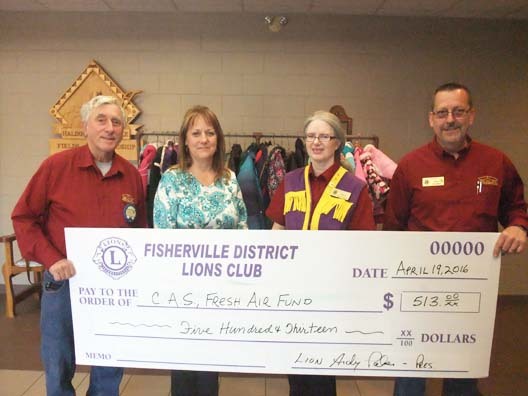 The Fisherville Lions Club hosted a Karaoke Coat Drive during March Break. The community was invited to come out and enjoy an inexpensive family night of great entertainment as well test their own skills at singing. The community was asked to drop off any gently used winter coats, snows pants or snow suits, which in turn were offer back to the community and schools to any child that may be in need. Shown in the picture are the remaining coats that were not spoken for. They were donated to the Children’s Aid Society of Haldimand and Norfolk. In front of the rack of coats, holding a cheque in the amount of $513.00 to the Fresh Air Fund is Doug Maxwell, singer and Lion’s member, Brenda Hunt of the CAS, Cheryl Fess-Clause, Child and Youth Activities Chair and Andy Palmer, Lion Chief/President. Doug Maxwell’s singing skills raised $200.00, and Karaoke Coat Drive raised $113.00 and the Lions Club of Fisherville matched the donation of $200.00.